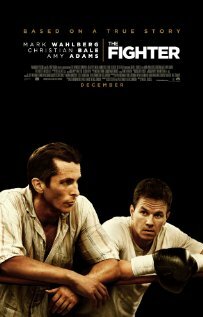 Continuing my series of movie reviews for this year’s Academy Award nominees for Best Picture, we come to the drama/biography The Fighter, starring Mark Wahlberg and Christian Bale. I’d seen no previews for this movie, and had heard almost nothing about it (until it was nominated for Best Picture) so I went into the theater intrigued. Wahlberg stars as Micky Ward, an up-and-coming boxer trying to find his way in the shadow of his older brother Dicky, played by Bale. The acting was solid across the board — all of the characters in this movie are flawed, and we’re welcomed with open arms into their individual issues. Dicky is still a local hero for having made a name for himself as a professional boxer, but has since fallen on difficult times. Micky is more clean-cut, but has been on a losing streak lately, damaging his confidence and making his professional future uncertain. The entire Ward family comes in, in a variety of different ways, and every one of them is fascinating in their own way. Ultimately this is a movie that succeeds because of the individual (brilliant) performances, but I was never truly engaged in the story for long. Yes, the story of Dicky’s fall from grace is interesting, and his sometimes-futile efforts to make a comeback are both heartbreaking and frustrating. And yes, Dicky’s attempts to be his own man (distinct from his older brother) make for a good story. But there weren’t many true surprises in the film, and I was never in doubt as to how it would end. Having said that, I definitely had moments when I was drawn in. When I learned the truth about Dicky’s current issues, I was suitably horrified. When I watched Micky stand up to his domineering family, I was happy for him. And at one memorable moment in a fight scene, I did clap my hands once in the air above my head and give a shout of jubilation, as if I was watching a real fight that I was truly vested in. But they were moments, and eventually they all faded in comparison to the fascinating individual performances. I enjoyed The Fighter, and I would happily watch it from the couch sometime in the coming months… But I wouldn’t pay to go back to the theater to see it again. It’s worth seeing, and is a good movie, but there are definitely more engaging films in the competition for Best Picture this year. This entry was posted on Wednesday, February 16th, 2011 at 8:26 pm and is filed under Uncategorized. You can follow any responses to this entry through the RSS 2.0 feed. You can leave a response, or trackback from your own site.